For the last 30 years, the top 1% of society has stacked the deck against the 99%. Greyhound workers know from painful experience how corporate greed benefits the suits in the corner office, but everyone else loses ground. Curbside buses like Chinatown's have 1.4 fatal accidents per 100 vehicles, compared with just 0.2 for terminal-based operators like Greyhound Lines Inc., according to a report released Monday. 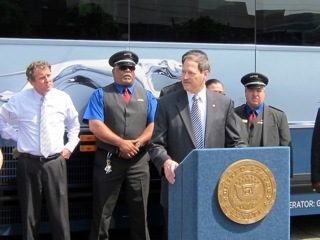 ATU adds Labor’s demand to national push for highway safety: Pay overworked intercity bus drivers overtime. A recent series of horrific bus accidents across the country has claimed 22 lives and injured hundreds, sparking bipartisan calls for highway safety. Some Republicans and Democrats are showing uncharacteristic agreement on legislation requiring seat belts, shatter-resistant windows and stronger roofs to reduce rollover fatalities. 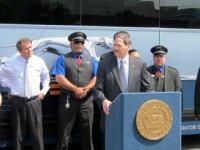 Others are calling on states to step up bus inspections.